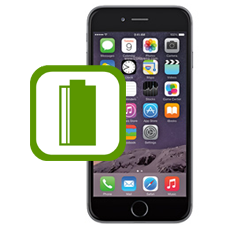 iPhone 6 battery replacement service, if your iPhone 6 does not hold a charge or the battery drains quickly during daily usage your internal iPhone 6 battery needs to be replaced. Our expert iPhone technicians are able to help you. We will remove your old iPhone 6 battery and replace it with a brand new original Apple iPhone 6 battery, test and then rebuild your iPhone 6.